Here is a little more progress on LHN. I did the tree yesterday. My DH surprised me and took the day off yesterday. 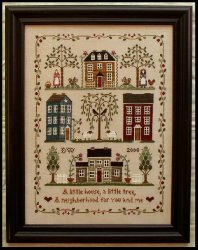 He worked on the chicken coop a little more and in between doing things for him and fixing lunch etc I stitched the tree. Now I am moving on the flower beside the house and then to the house itself. I love this project! The squirrel is sooooooo cute! It looks great! Debby you are making great progress.